We need cars and bikes to co-exist, says Joel Diener. Photo by Ted Simpson. I own Saslove’s meat market just up the block from the new bike corral featured in your article on July 10. I was shocked to see it appear one morning and even more surprised that out of the entire street they had to put it in that particular spot… a spot on the busiest block of FOOD shopping on Wellington West. A spot where people rush from store to store grabbing their bagels and cheese, across to buy their fresh produce, then off to get fresh pasta and sauces and then off to get their fresh meats and deli. Yes, we are like a mini supermarket divided into 4 separate entities but we are local and independently owned. We are an integral part of the community. We are so fortunate to do business in such a wonderful area with so many loyal and friendly customers. We are in a neighbourhood that is “bike popular” for lack of a better phrase. 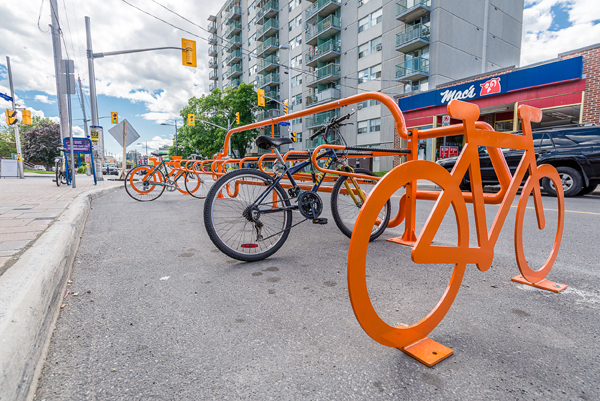 As you mentioned there are 268 post and ring racks along the street, meaning that there are 536 bike spots not to mention the many other bike parking spots provided by businesses. I am sure that the number of car parking spots on Wellington West pale in comparison. Each car parking spot is valuable around these parts. So eliminating one of five spots on the north side here is a serious blow to those who cannot walk or will not bike and need to come by car. What about the seniors, or the families that want to come together, or that rainy day when one doesn’t want to bike? Losing that car parking spot or any spot on Wellington creates another impediment to those who come from Kanata, Craig Henry, Barrhaven, Orleans, Gloucester and all the other areas that are distant from this fantastic area. One spot may not seem like a big deal, but it is to the businesses on this block who struggle to keep their many customers happy. Each day I hear of someone who used to come here to shop saying it is too big a pain in the a.. so off they go to Loblaws or Costco. Yes the quality isn’t the same but hey, it’s convenient they’ll tell me and in today’s world it is all about easy, quick and convenient. Now that we are faced with higher taxes, much higher rents and crazy hydro bills we cannot afford to lose one customer let alone one a day. I am a cyclist and I think that it is fantastic that more people are cycling. I welcome everyone who can to come here by bike but putting this corral on an already unsafe and bike unfriendly street is ridiculous. Taking away a precious parking spot is also unfair to us and the other businesses that need clients from other parts of Ottawa as well. So while I think that we should encourage more bike use, we need to do it wisely. We need safer roads. We need cars and bikes to co-exist. We need corrals put off to the side where they don’t take away valuable car parking and where they don’t endanger cyclists, automobiles and pedestrians. We need to find a spot for the corral that does not hinder sidewalk use and car parking. We need to look around the corners to find a more suitable location for the corral on unused property where it will be safe and more practical for all. We need common sense. Being a cyclist I understand the need to be able to park my bike. But being a motorist as well, I also need to be able to park my car. There is no reason why we can’t all be satisfied. I support bikers and the corral, but I oppose its location. Thanks for allowing me to say my piece.